Despite experts recommending against it for years (decades? ), having a goal of zero injuries is quite popular these days. One organization we are familiar with had such a goal that was handed down from the corporate offices. I assume it was with the best of intentions: what leader wants to see the people in its organization get hurt? The organization even had discussions at a high level about divesting in the riskiest parts of the business. “If we can’t do this without hurting people, then perhaps we shouldn’t do it at all.” So, this was not purely about money – at some level there were truly caring people who devised the zero injury goal. The problems came in translating it through the levels of the business. It’s one thing for an executive to publicize an audacious goal, but it’s another thing for middle managers to execute on it. One impact that the goal had was to put immense pressure on managers to eliminate injuries at the location they manage. The pressure was so intense that people feared for their jobs when injuries were reported. At the very least, people get more focused on the goal than on doing the right things every day to make it more likely that people will be safe. In the worst cases, people avoid reporting when they can. This is what we mean by ‘downstream impact”. Putting pressure on a middle manager can have the downstream impact of pressuring general managers to pressure operations managers, who then pressure their staff, who pressure supervisors and the workforce. At some sites, the workforce gets so invested in reducing injuries that people injured on the job are afraid of reporting the injury, for fear of retribution from coworkers. This is for real injuries, not to mention property damage, equipment-related incidents, or close calls. Those can become even more elusive in this environment. And then consider the effects this fear could have on your operations and quality troubleshooting, where in order to solve machinery problems you need honest reports from the workforce about what is happening. It’s true getting overly focused on the goal can drive reporting and honest dialogue underground. If any of you have seen something like this happen, I’d love to hear from you about it. Behavioral science would suggest that it’s something that occurs more often than we might hope. 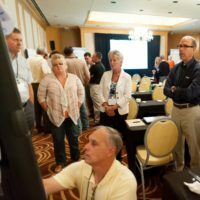 Learn leadership skills to reduce injuries, improve production, and much more!